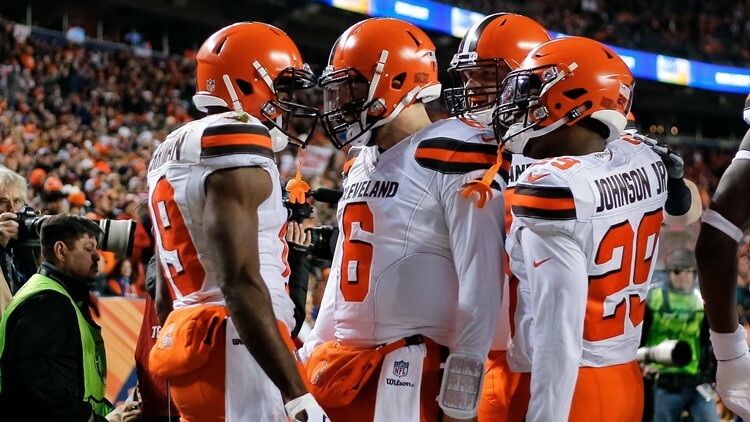 Cleveland Browns quarterback Baker Mayfield (6) celebrates with wide receiver Breshad Perriman (19) and running back Duke Johnson Jr. (29) after a touchdown in the first quarter against the Denver Broncos at Broncos Stadium at Mile High in Denver. The already slim playoff hopes of the Cleveland Browns took a serious hit on Sunday. First, the Baltimore Ravens, Indianapolis Colts, and Tennessee Titans all won to improve to 8-6. Then the hated Pittsburgh Steelers beat the New England Patriots to improve to 8-5-1, eliminating the Browns from contention in the AFC North. If all of that madness happens, the Browns, Colts, and Titans would all be 8-7-1. The Colts would eliminate the Titans based on the former's win over the latter earlier in the year, but the Browns would eliminate the Colts based on a better record against common opponents (3-2 vs. 2-3). Meaning, the Browns would make the playoffs for the first time since 2002. So there you go, fans. You know what has to happen. Keep those fingers crossed!